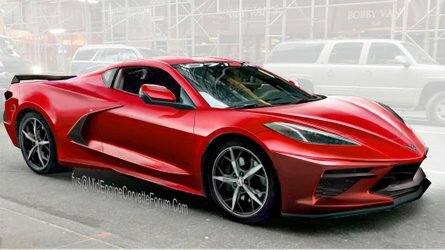 The company thinks this electric three-seater would appeal to women between 30 and 50 years old. 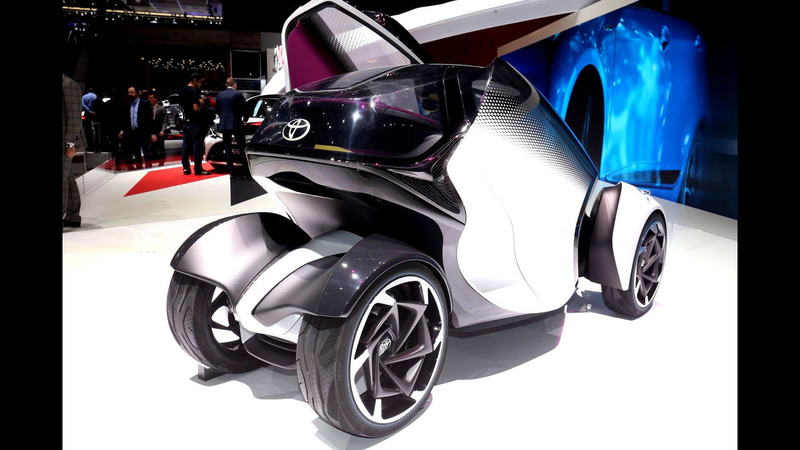 The Toyota i-Tril Concept rolls into the Geneva Motor Show as a vision for getting around the city of the future – specifically in 2030. The company’s designers at the studio in Nice, France, have a very specific demographic in mind for this three-seater, too: “a sophisticated, single, 30-50 year old active female with two children and a vibrant lifestyle” who lives in a small- to medium-sized town. The i-Tril evolves the look of the previous i-Road concept by taking the idea of a city-focused driving pod and adding more cabin space. The new model retains the Active Lean system and can tilt up to 10 degrees into corners while the rear axle stays planted to the road. The tech creates an engaging driving experience by being more like a motorcycle and allows for a tight, 13-foot turning circle. 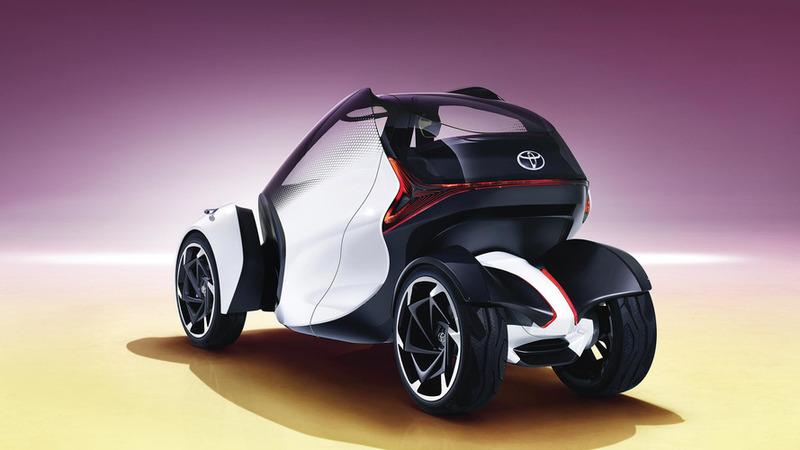 The i-Tril gets around using an electric motor, but Toyota doesn’t disclose how powerful it is. The company claims the powertrain offers a range of over 124 miles (200 kilometers), though. Once occupants step through the butterfly doors, the driver finds a unique cockpit layout. Rather than traditional pedals, the person in front grips things akin to video game controllers. These allow for making braking, steering, and acceleration adjustments. A central head-up display replaces the usual instrument panel. The i-Tril can also pilot itself autonomously. The seating configuration is somewhat like the classic McLaren F1 by having the driver in the middle and allowing for two passengers further back. According to Toyota, this layout maximizes the legroom and outward visibility for all occupants. According to Toyota, expansion in major European cities like London and Paris will slow down in the coming years, and there will be a greater emphasis on the medium-sized locations around these metropolises. The i-Tril is supposed to excel in these newly popular environments. Toyota eventually began doing consumer trials of the i-Road in Japan. So we’re curious whether the i-Tril remains purely a concept or eventually gets some actual on-road development. Such an innovative vehicle layout could be a cool alternative to the company’s previous rather boring efforts at a small city car, like the iQ. 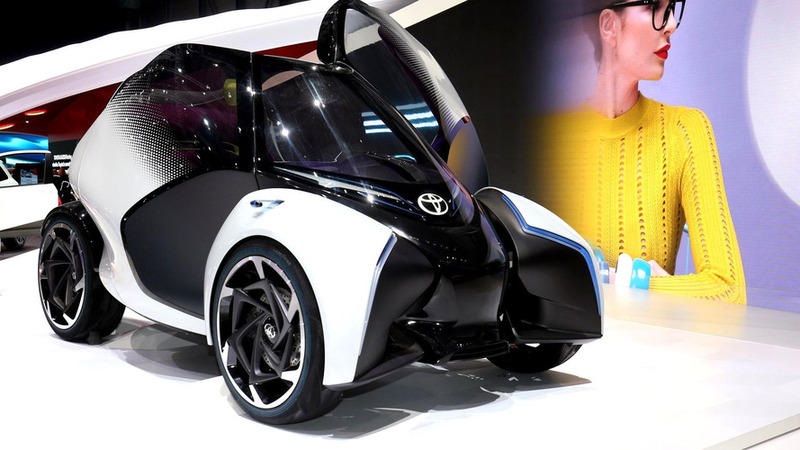 Developed by Toyota Motors Europe (TME) in collaboration with the company’s ED² design studio in Nice, the new i-TRIL Concept showcases numerous innovative aspects of Toyota’s research into ever better and more engaging environmentally- friendly mobility solutions. Making its world debut at the 2017 Geneva motor show, and featuring Active Lean technology, the new i-TRIL concept represents a viable alternative to A and B segment cars, other EV products, public transport and motorcycles. Heralding a change in mindset for motorists, the i-TRIL is designed to be more than a mere commodity. 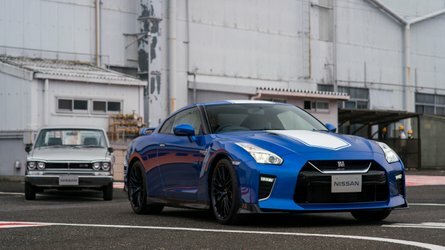 Driven by Akio Toyoda’s commitment to bring passion and driving pleasure to all future Toyota vehicles, it embraces the company’s Waku Doki (a Japanese term translating as ‘Beat of the Heart’) philosophy to demonstrate that future EVs can still stimulate the senses and set the pulse racing. A different type of transport for those who still wish to have fun whilst driving even at slow speeds in the urban environment, it represents all the best elements of future mobility beyond mere eco-friendliness. European Union studies on the future of cities have suggested that, rather than further expansion of already vast metropolitan areas such as London and Paris, the continent will witness a steady increase in growth of built-up areas adjacent to existing cities, in the manner of medium-density suburban pockets of deve-lopment. The number of such SMESTOs in Europe is already significant, and their inhabitants travel extensively to take children to school, shop, visit restaurants and socialise. As such, their sometimes difficult, stop-start mobility requirements are for small, agile and urban-friendly vehicles. Toyota’s research with SMESTO-dwelling target customers identified an active mother often torn between ‘Me Time’ and spending time with her children ‘Kids Happy’; increasingly confident in her behaviour, she refuses to be a slave to those children. 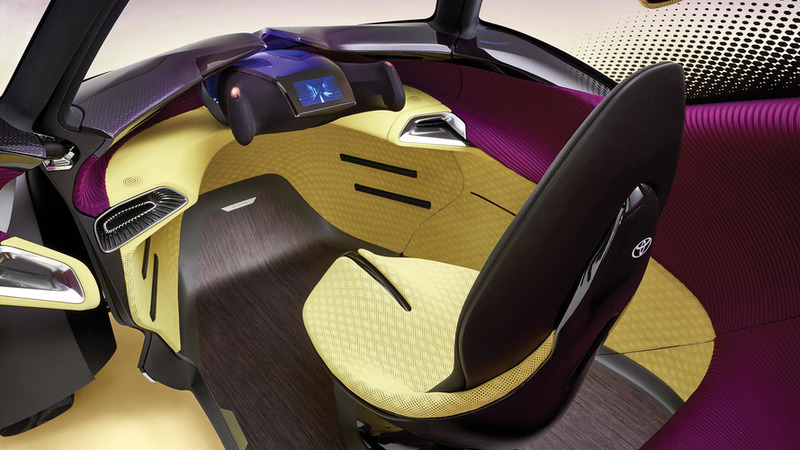 The new i-TRIL Concept embraces and mer-ges this apparent conflict of loyalties through three functions: Active Lean technology; ‘Relaxed Engagement’; and the unique One-plus-Two seating layout of the vehicle. Driven by electric motor power and weighing just 600 kg the i-TRIL is some 2,830 mm long and 1,460 mm high. It features 1,200 mm front and 600 mm rear track widths, with a hinge between the rear axle and cabin allowing the vehicle body and front tyres to lean whilst the motorised rear tyres remain perpendicular to the road surface at all times. With the front wheels and fenders clearly separated from the main bodyshell to facilitate the leaning of both the former and the latter, the cabin consists of a smooth, dark, cocoon-like central mass with no belt-line or door handles. This is visually overlaid with a surface wrapping which undergoes a seamless transition between the body colour it shares with the front wheel arches and the transparent cockpit glazing, whilst emphasising the powerful forward movement inherent in the i-TRIL’s silhouette. The butterfly-opening doors are hinged on the sloping A pillars to maximise the opening area and ease of cabin entry to even the rear seat passengers, whilst requiring no more opening room within a car parking space than conventional doors. The robustness of the vehicle architecture and the added width of the rear cabin to accommodate a two-seat bench are reinforced from behind by the full-width combination lamp design above a clearly separate rear axle structure which incorporates the electric motor drive system. 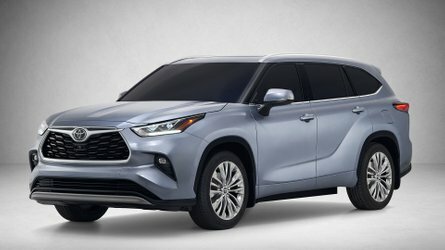 Using their previous experience with Active Lean technology, Toyota’s engineers discovered that a lean angle of 10 degrees proves perfect in combining enhanced stability and grip, greater fun and driving pleasure, and less risk of passengers suffering from car sickness. Allied to 25 degrees of front wheel steering, this technology equips the i-TRIL with a turning circle of just 4 metres (similar to that of the Toyota iQ), making it not only highly engaging to drive at even modest speeds, but also very much at home in even the most congested urban environment. Aspiring an actual driving range of more than 200 km between charges, the new Toyota concept is capable of operating autonomously, but has been specifically conceived to provide such driving pleasure that owners will wish to drive themselves for the majority of the time. From the perspective of ‘Relaxed Engagement’, target customers were asked to sample a range of driving positions. 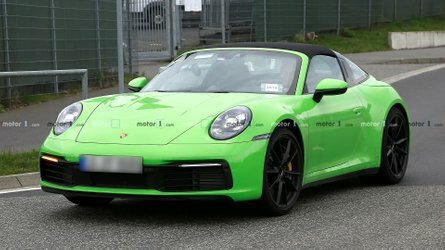 They chose a slightly higher, yet relaxed and laid-back driving position -almost akin to that of a go-kart- with good engagement of the steering module. This latter is important, because the i-TRIL has no pedals, enabling the driver to stretch out their legs in comfort, and wear whatever style of footwear they choose without risk of losing control of the vehicle. The base of the driver’s seat features a central rib to offer a snug, highly-supportive fit for the occupant’s legs. Steering, acceleration and braking is all carried out via drive-by-wire technology. The i-TRIL is operated by left- and right-hand control nodes (in the manner of computer mice or game controllers) which extend towards the driver’s hands beneath the stretch fabric covering the manual driving module. During autonomous driving, the left- or right-hand instrument panel extremities automatically illuminate whenever the i-TRIL is about to enter a corner, letting all occupants know which way the cabin is about to lean. There are no other controls or switchgear, and no driver’s instrument binnacle. In manual driving mode, a simple head-up display gives the driver all the information they need. 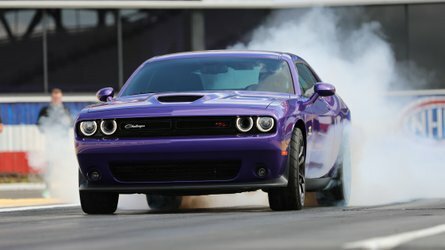 A completely new approach to the Human Machine Interface (HMI) focuses on voice activation technology, communicating with the vehicle’s Artificial Intelligence for the control of multimedia and infotainment systems. Allied to the vehicle’s Active Lean technology, the i-TRIL interior allows the rear bench seat passengers to become much more involved in the driving experience. It brings the children very much closer to their mother, without actually interrupting her space. Better yet, it affords them far greater forward visibility, uninterrupted by a front seat headrest immediately ahead of them. The front seat headrest is actually fixed to the roof of the vehicle, and pivots down into position when the i-TRIL is switched on. Children also benefit from extensive legroom either side of the front driver’s seat. And there is, in fact, room for three adults on board as a result. Careful consideration has been given to how the driver enters and exits the vehicle as easily as possible. When the cabin doors are opened, they remove a section of floor with them to narrow its footprint and make stepping out simpler, with a shorter stride. Moreover, the front seat may be swivelled through up to 20 degrees to allow the driver to both enter and leave the cabin more decorously. The interior has been designed specifically to avoid an overtly automotive feel; rather, the alcantara trim, fabric rear bench seat upholstery and wooden floor finish -all made from recycled materials- offer occupants a more comfortable environment styled on a comfortable and exclusive living space in the home. The ribbed texture of the rear bench seat fabric radiates outwards to emphasise the width of the rear cabin space. In addition, the tread pattern to the Goodyear 19” front and 20” rear tyres has been exclusively cut to match the design of the interior trim. Despite its clear separation from front (Me Time) to rear (Kids Happy), the interior space is still unified by the overlapping of the front alcantara and rear bench fabric upholstery, and by the ducting system which distributes ventilation airflow.